The new areas great! I love the focus on the food and drink stalls. TBH, they are always an afterthought for me. But here they are the star of the show and I love it! very nice, and on the third photo...there is a weird optical illusion as it looks like the planter box in the middle of the path is floating, but its not. It seem that in this park, peeps cant get enough food and drink, which would be great if I was actually paying attention to finances. Wow this is super impressive. So much character and your facades are so visually dynamic that theres always something to look at. 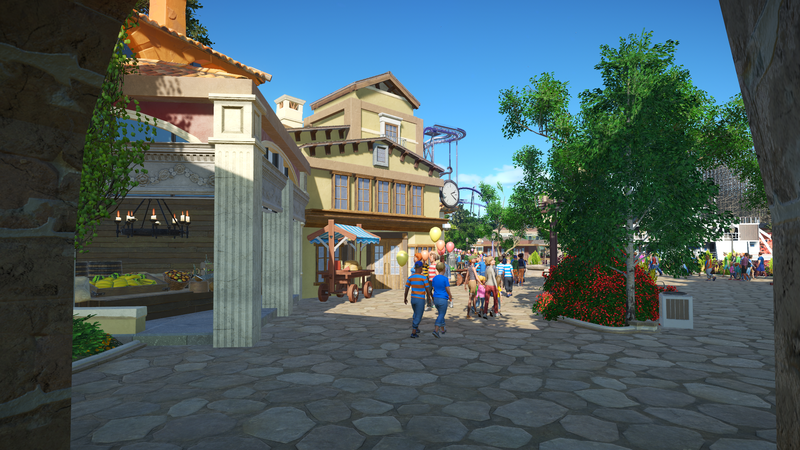 Feels VERY theme park-y and thats a good thing! 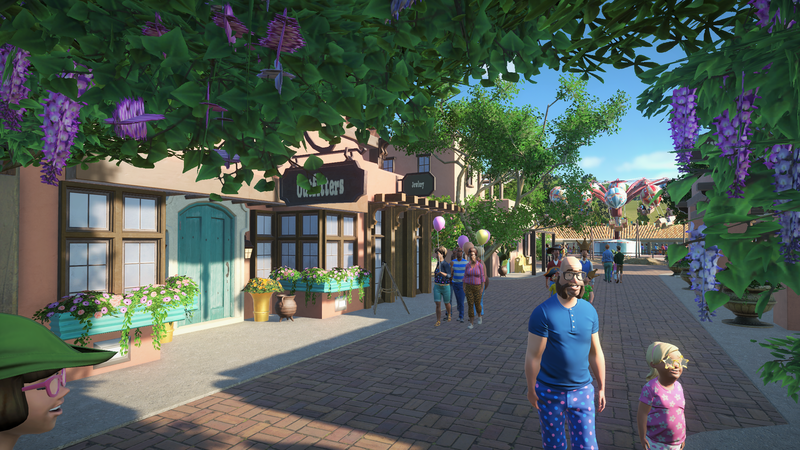 You've done a really great job with area development, your streets just seem to make sense. Thanks! I'm trying to create something interesting to look at "around every corner". 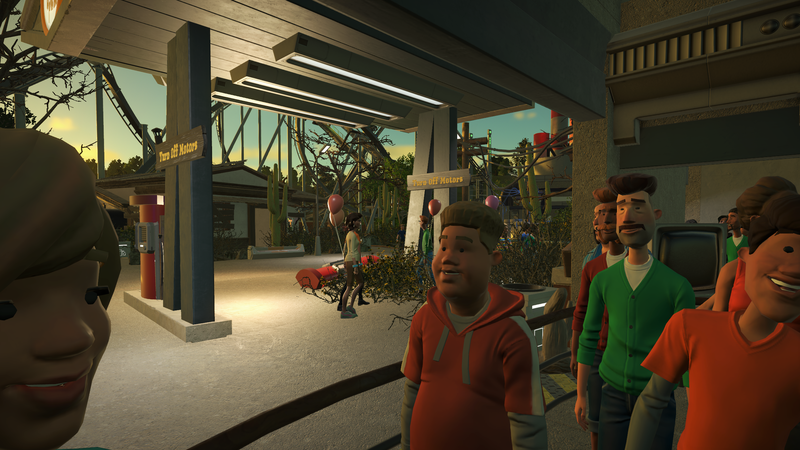 In our update 4, we are continuing the tour around the park. The focus this time is on Pueblo del Rio. This area is divided into two parts. 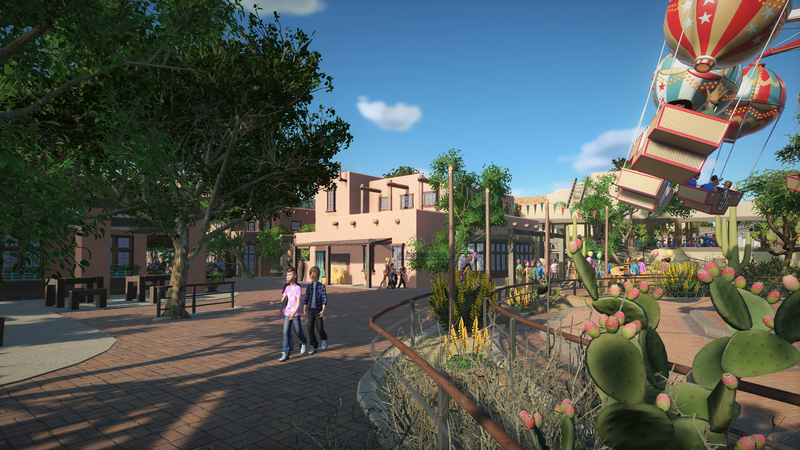 The Pueblo is geared more towards families, with a "kids" coaster and a flat ride. As always, shops and eateries are available. This lush next-to-the-river town is abundant in warmth and charm. It's always popular with the families. 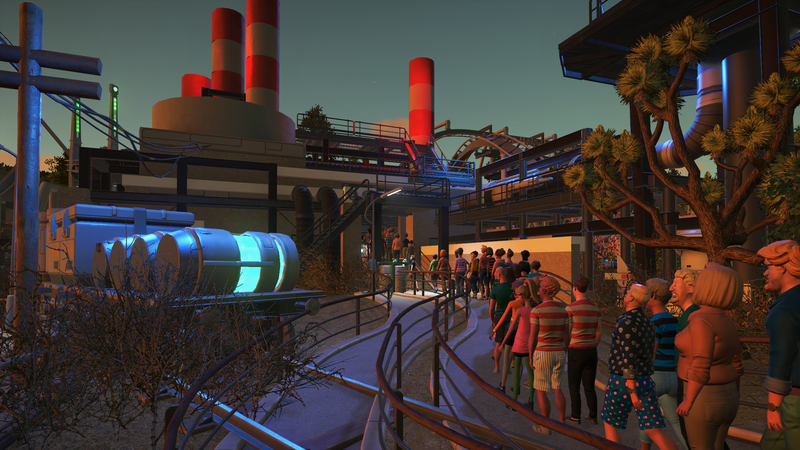 The queue for the coaster (we will get to the actual coaster in another update), is always full, and several peeps turn away unhappy. In the other section of this area, themed to a nearby town of the Pueblo, is the abandoned service area surrounding a Nuclear facility. A B&M Invert dominates the skyline in this area. Word from the locals is the Plant was experimenting with radioactivity and devices to scan for uranium. Said device may have gotten out of hand. The queue starts with Morphie Gas, a subsidiary of DelMass Power Conglomerate. Dat gas station, tho...and that pueblo architecture. This is awesome. It's great seeing how PC has allowed you to really unleash your design abilities and creativeness. 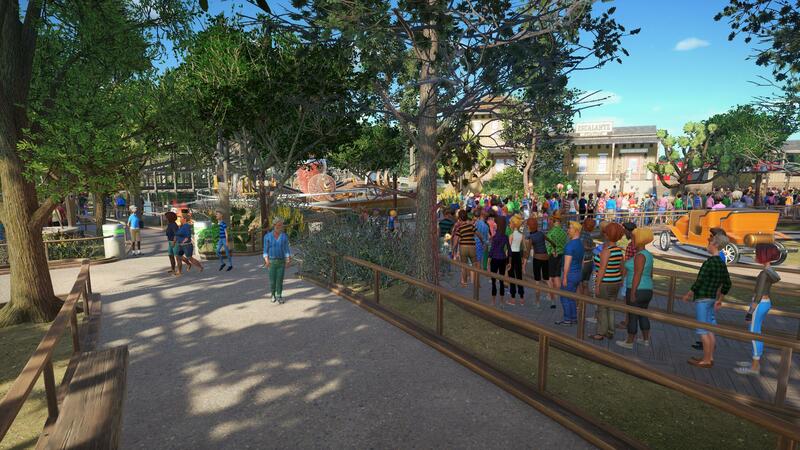 This is quickly rocketing up the list of "masked's favorite park projects." Haha. Can't wait for more! I see so much of Lumiere in this park. mb- Cheers! Here's to hoping the Mesa doesn't disappoint, or Morphies gas prices don't go up. I'm really liking this park. Looks like the Old Town of Albuquerque and the old nuke plant puts a weird spin on it. Very nice! That contrast between the first photo and the nuclear facility shots is fantastic. I would struggle to make either area look this good and you've succeeded at both. 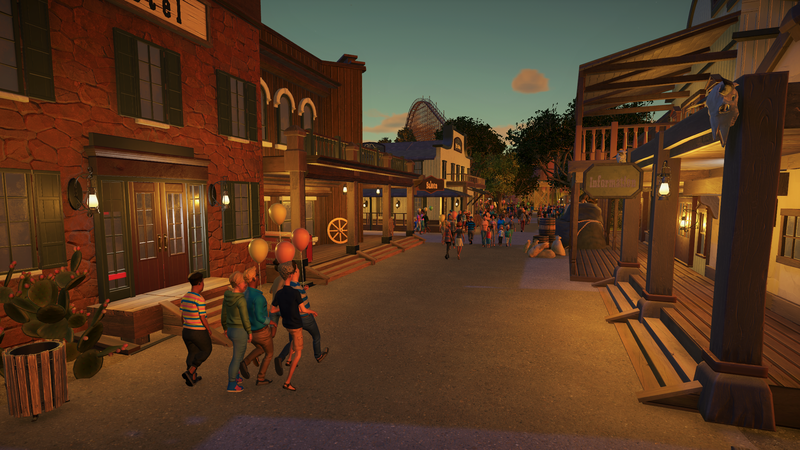 I love everything in every picture, but I think I keep going back to that first photo because that's a scene that would look good in any park, just so cozy and comfortable. I believe one of my 'inspirational' pictures was of something in Albuquerque, and Santa Fe (naturally). Thanks! And develop it shall! 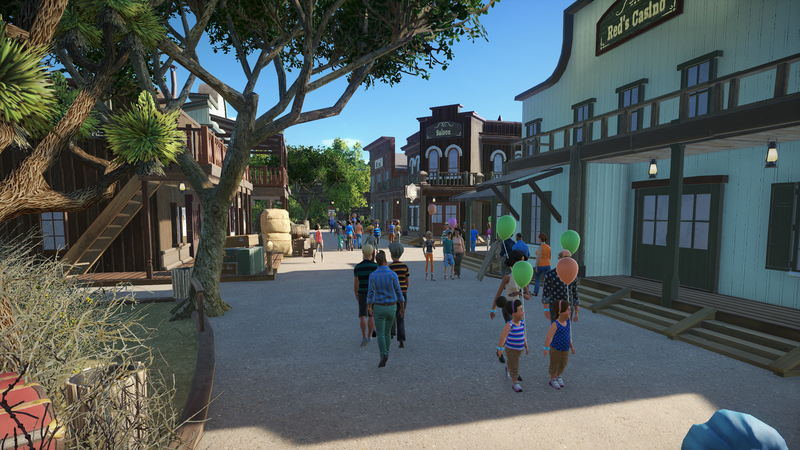 I have big plans for every area of the park, lots of future development! If I had to live in one picture, I think I would chose the first. The atmosphere speaks to my soul haha. The transition it quite simple, as if you were stepping out of town limits and onto a wandering road into a small industrial power district. We are down to our last two areas of the park. 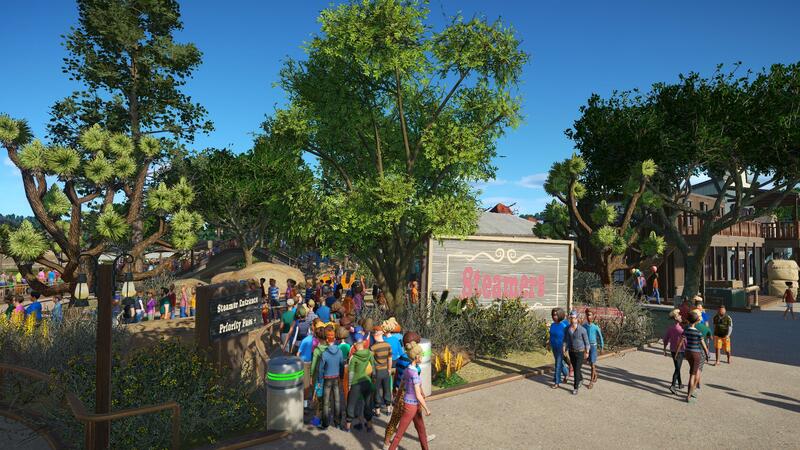 This update will focus on Escalante, by far the largest section of the park. The town has a long and tired history involving outlaws, heists, rangers with little-man-syndrome and a long shut down house of ill-repute. Needless to say, Escalante is now "family friendly" (for the most part). I have been told that the town still has a dark secret, but even the locals won't give into gossip and tell us. And in probably our most boring picture of this update, we can get a glimpse of said vehicles. In the background is Escalate Station. 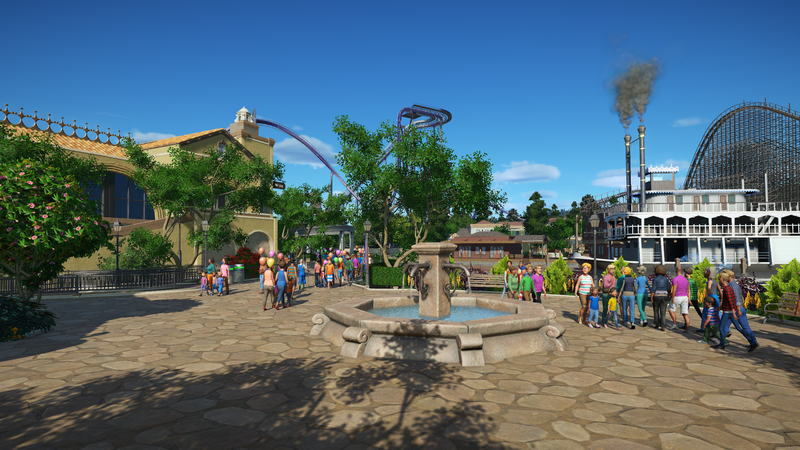 Express service to area X (our only uncovered section of the park, and its not literally called area X) and Padre Springs. We also have a random flat ride, a spiny vomity thing called Spark Shocker. A Prospector got inspired for the ride watching a train brake, the wheels shooting sparks in every direction. Quite a sight. The crowing jewel of Escalante is The Outlaw. A wooden coaster of which we will get to later. That will be all for Update 5. I will leave you with a nice twilight photo. 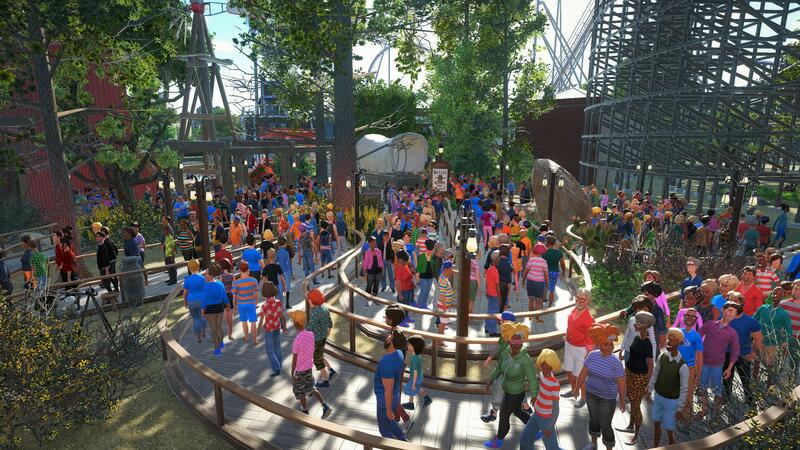 Good looking park, can't wait to see that wooden coaster. I would like to present the jewel of Escalante; The Outlaw. I'm jealous of your coaster skills. That one is both good-looking and a very fun ride. You're really succeeding at a park style I've tried at many times with much lesser results. 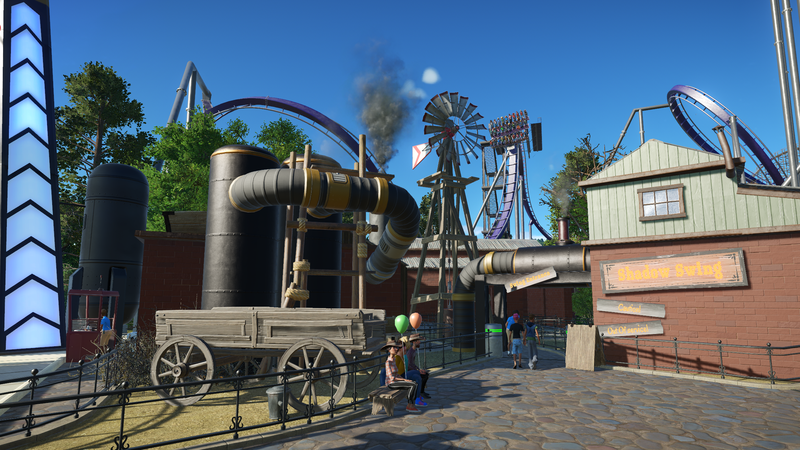 Normally I'd say the monorail is breaking up the theme, but since you've already established that this isn't purely a rustic park I'm confident it's all going to work out. Nice job. 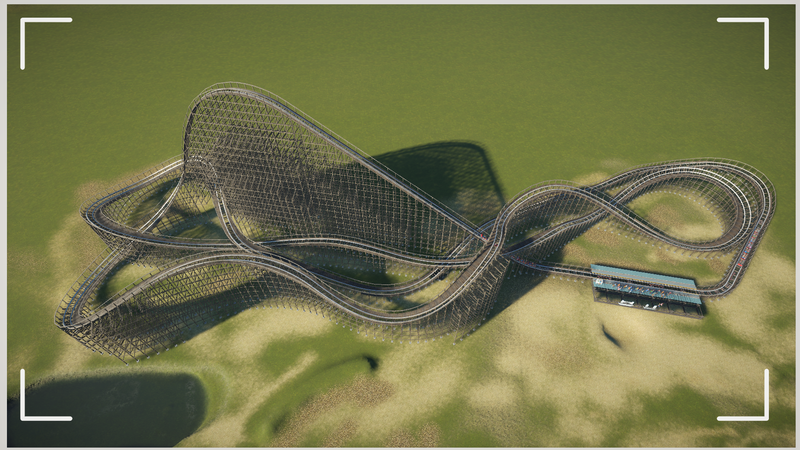 Great Coaster! I love the curved drop and back up! Excellent job! How many times to Disneyland in one year is too many??? There is never too many. 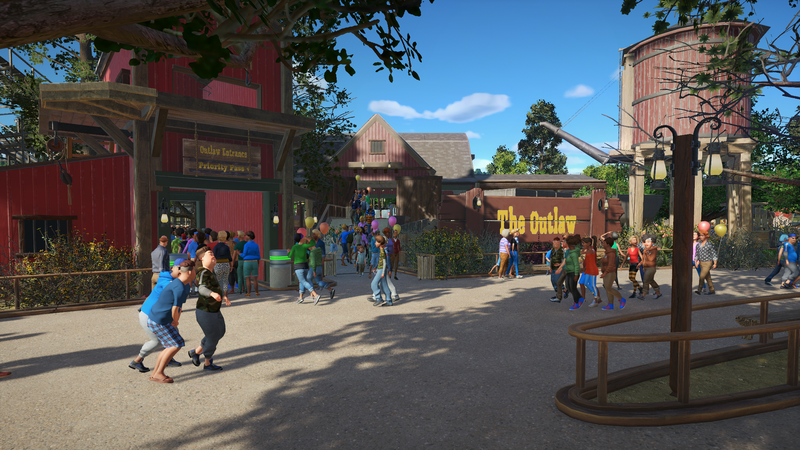 I love the layout of outlaw! Its quite balanced and has interesting dynamics! Keep it up! Those modern mexican building look amazing! Im really loving everything. Town of Escalante also looks really cozy! 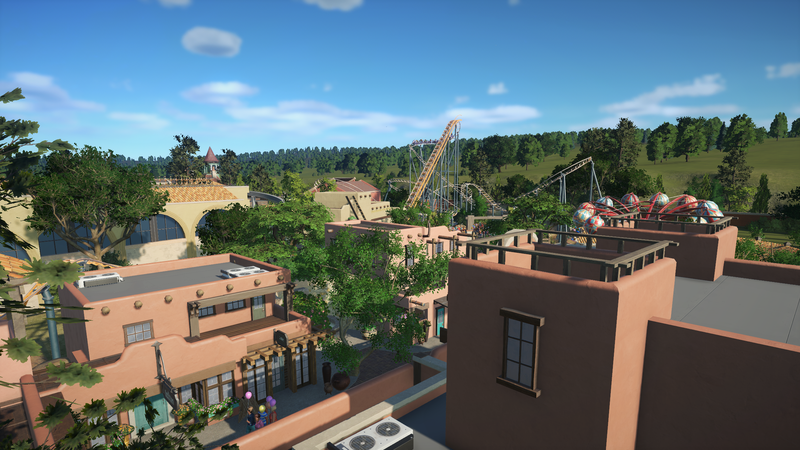 Loving the progress on this park. You've kept the realism throughout. I really like the gas station, very unique. I really simplicity yet realism of your architecture. 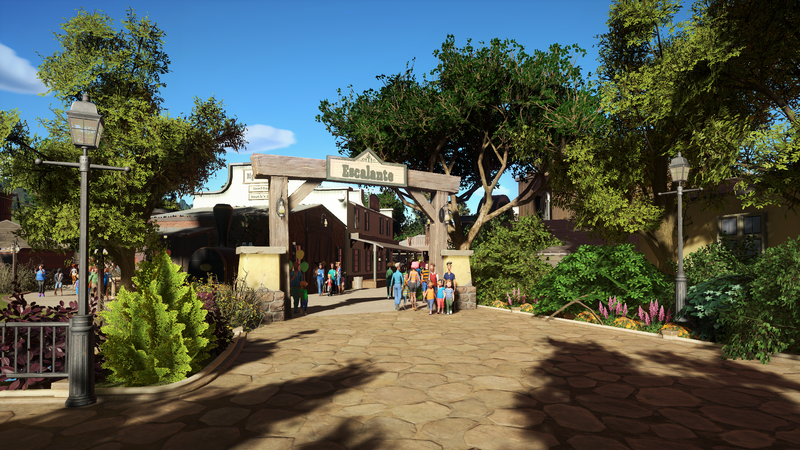 You've created visually appealing structures and landscaping without adding layer upon layer. Awesome work! In update no. 6, we will explore the last section of the park; Breaux Swamp. The Swamp is the second largest area of the park, yet the smallest in terms of peep "explorability". 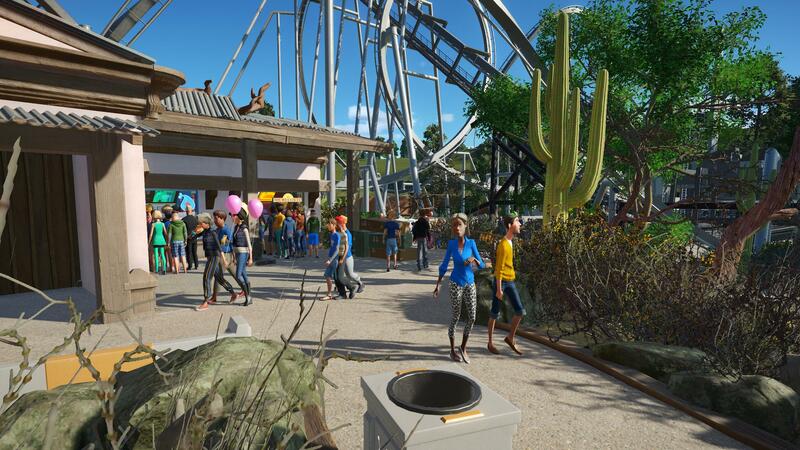 The area is dominated by a B&M Dive Machine, as well as a river rapids ride, both of which taking up a large footprint. Peeps can eat, drink and shop in a small portion of the land. The areas premier attraction is Specter. 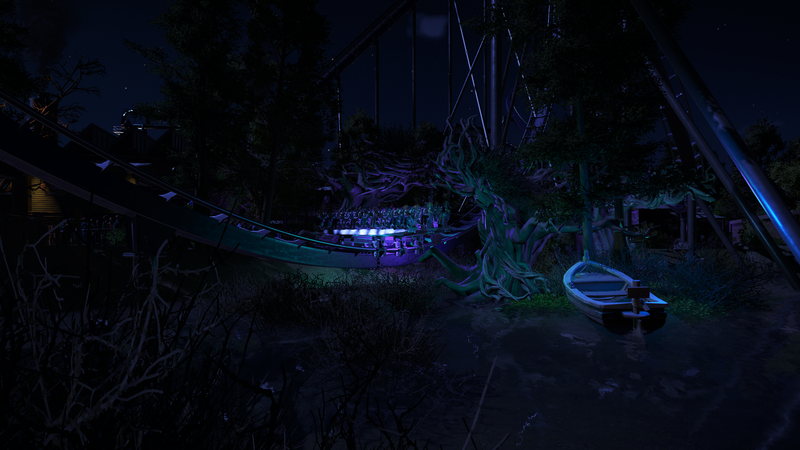 Themed to the spirit that haunts the industrial park of Breaux Swamp, Specter is the dark and underlying mystery that guests are too curious not to encounter. A POV video will follow within the next few days along with stats. 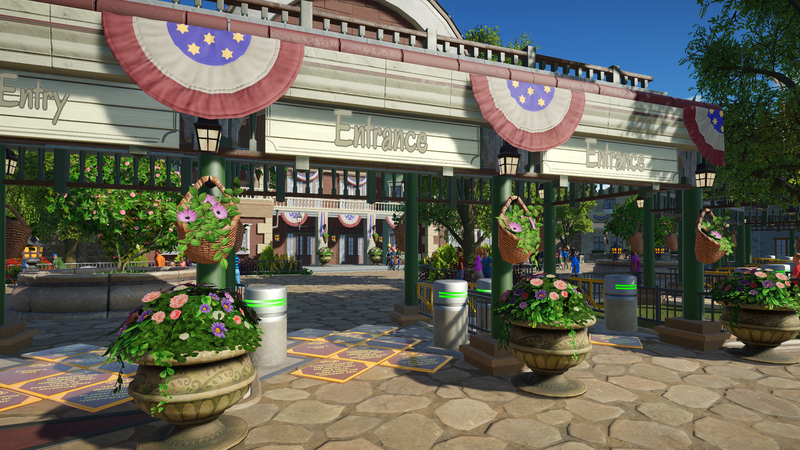 Shadow Swing is an S&S Screamin' Swing, The areas least favorite attraction. Tucked into the back corner of the land, it doesn't get the foot traffic it deserves (although its a terrific thrill). Swamp Loggers is the parks only water ride. The river adventure takes you deep into swamp logging country. 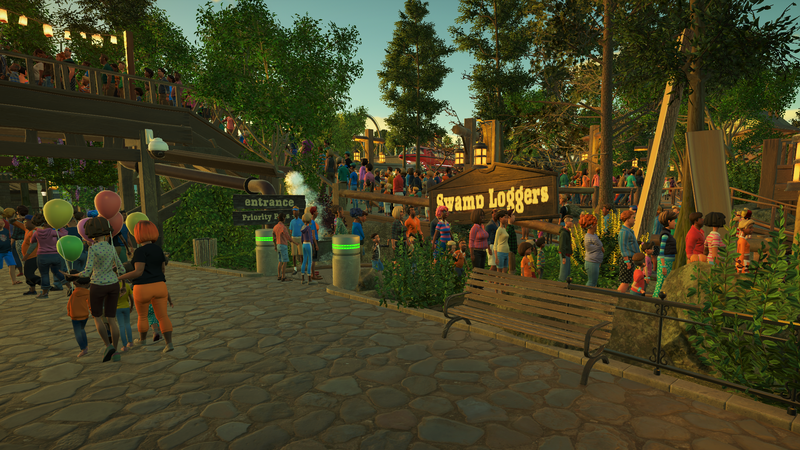 As the park is in Texas, the heat definitely drives Swamp Loggers to always have a full queue. 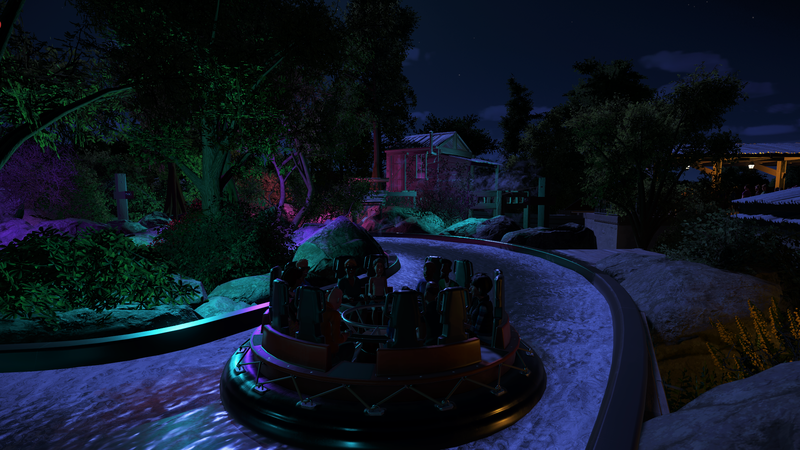 Swamp Loggers comes alive at night with an array of lights and effects. 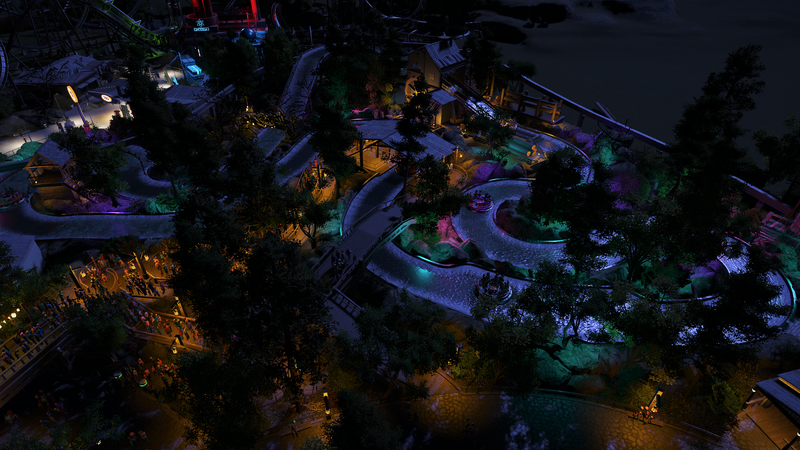 An overview of the Intamin River Rapids. I will leave you with a beautiful shot of Specter, dropping into the swamp. Progress! Realism is the name of the game for me, at least most of the time. Thanks!! Thank you! I have always loved the process of creating coasters. 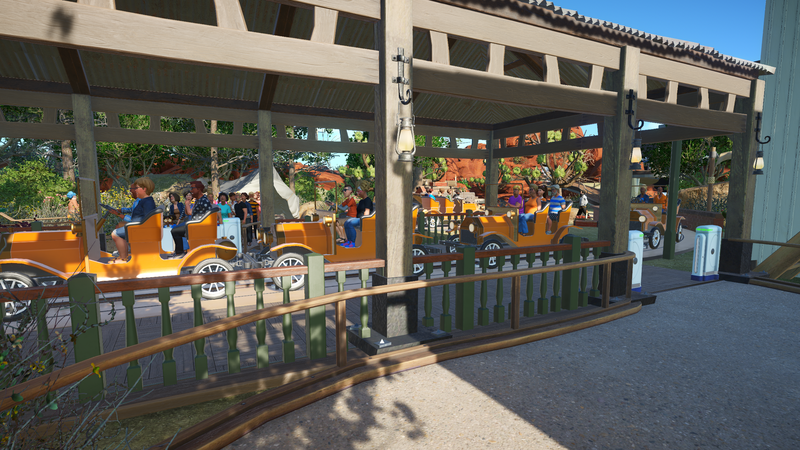 Sadly, building coasters is only a small percentage of 'park making'. 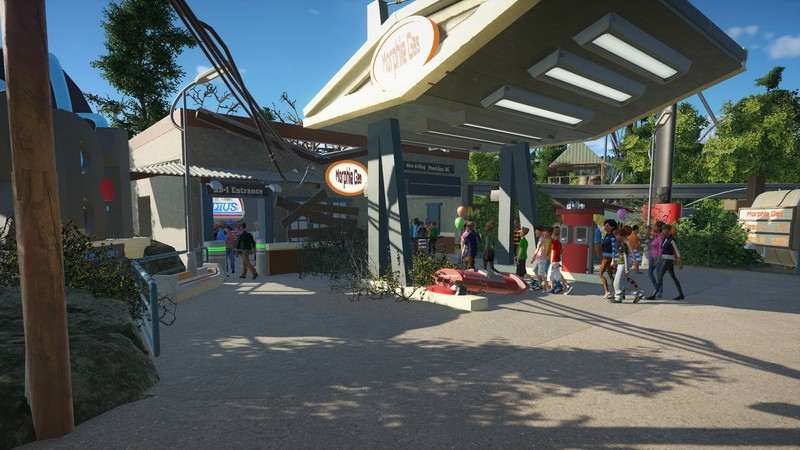 From what I have developed so far, monorails are a signature piece of JC8 parks, as I feel they should be utilized more in real life. Its just a fun addition that makes me happy! Thanks! I wouldn't want to live in Escalante though, too much crime for me. Spector looks wonderful! Love the abandoned factory look, with the boarded up windows! I would like to present the legend itself; Specter. In the days where banjos and big band were in full swing, a spirit took home in a lumber mill. Reports of mysterious deaths and hauntings eventually caused the mill to close, although this never stopped the curious. Eye witness reports claim purple auras out of the corner of their eyes, some claim to have seen it moving towards them at a mesmerizing speed. Local authorities have dismissed rumors of the abandoned the mill for a lack of evidence, and sold the property to a development company out of eastern Texas. Surveyors and architects flooded the scene with dreams of a new and high-tech factory. The main atrium was dark, and the bulbs of their flashlights burst. Beams above their head began to creek, and dust feel all around as the daylight that poured in the broken windows disappeared. The Specter was upon them. The men heard an horrifying shriek from above and black mass with a glowing purple center dropped down and consumed them. The Specter burst through the roof and up into the clouds as its aura grew larger, leaving behind soot and ash in its trail. It climbed to a dizzying altitude to devour the men, and when it was done, dropped what was left of the men down into the swamp. Needless to say, the old lumber mill remains empty. Curious tourists and ghost hunters still attempt to break in, though they are always watched by the hungry Specter. I guess you'll just have to stay tuned! That's a nifty ride, and the story is suitably scary. I have a question...When the trains skims the water, did you make the splash with triggered events, or does it splash automatically? ^triggered events. I would prefer more of a jet coming from the back in an arc, but the in-game effects work just fine. 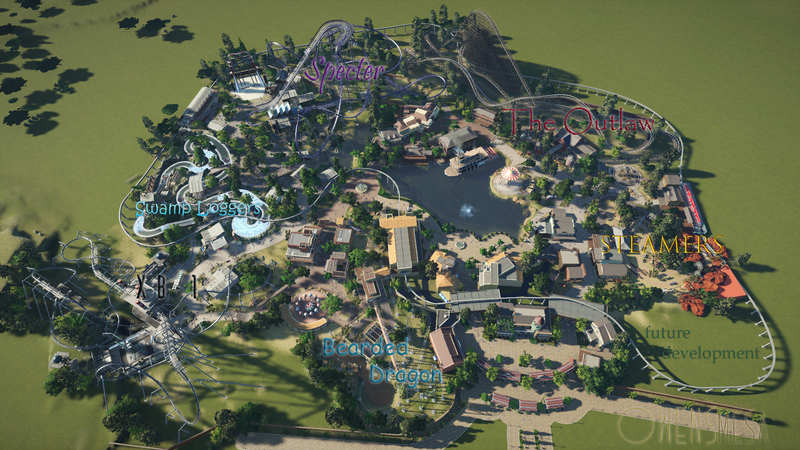 Now that we have explored all areas of the park, I felt it was necessary to release a "park map". The grand opening is near and regular season updates will begin soon! 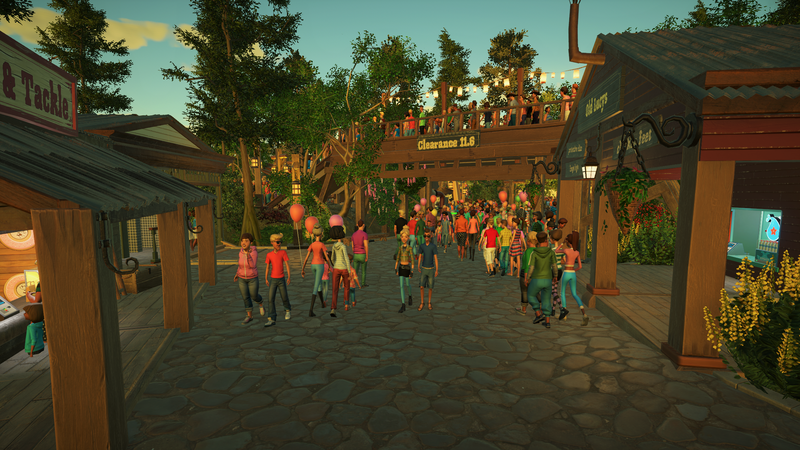 Thanks to everyone for their kind replies and I hope you are enjoying the park so far! Thanks! Even real life dive machines have a deep roar that is simply goose-pimple worthy, I love it! Love that aerial shot. Nice work! A beautiful project, and really nice to see how the whole thing comes together in the aerial overview. 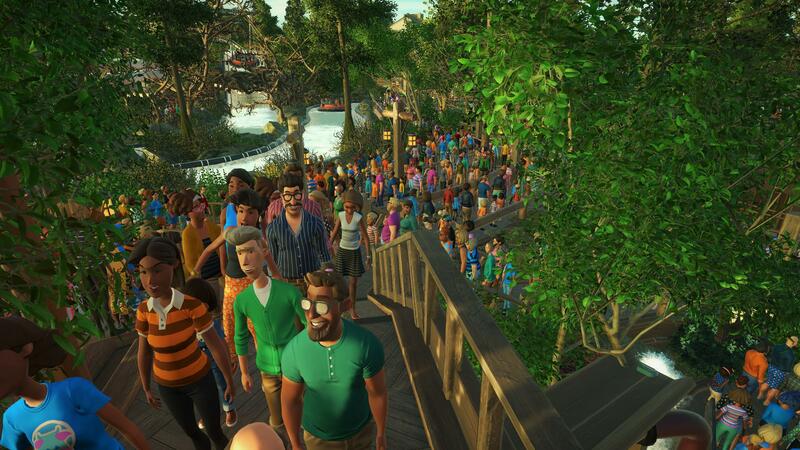 Looking forward to taking a stroll through the park. A bright and beautiful morning at Owens Mesa! 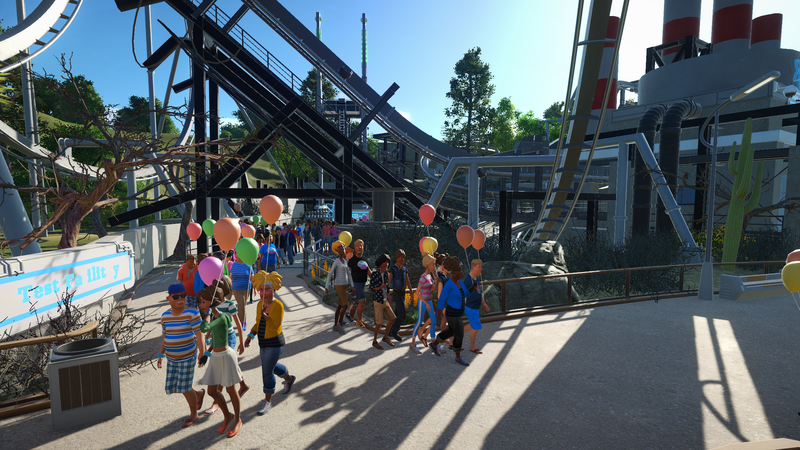 Grand opening was a few days ago and the park has been PACKED since. First and foremost, I need my coffee. I love the open market shop there, great place to grab a piece of fruit or something on the go. I had to stand here for a few moments and take in the view. I'm ready for a day of adventure!! I headed over to Steamers first, and the queue was already full. I'll follow the fellow peeps and come back another time. I did however go up to the exit and tried to get a glimpse of what the ride had to offer. I see some animatronics and mountain-work! Escalante was packed so I ventured over to Pueblo del Rio. Bearded Dragon's queue was long as well, but I sucked it up. +2 Credits! Next I ran over to XB-1. 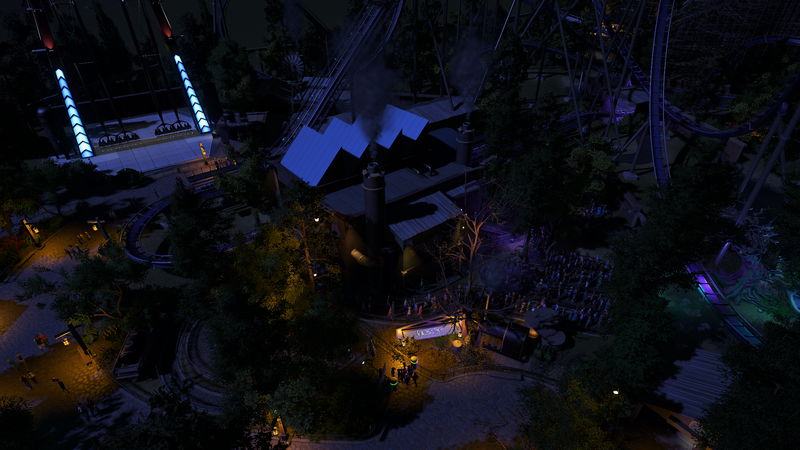 The whole area had a great disaster/abandoned feel! The area was rather light with foot traffic so I rode it twice! Shadow Swing was empty! 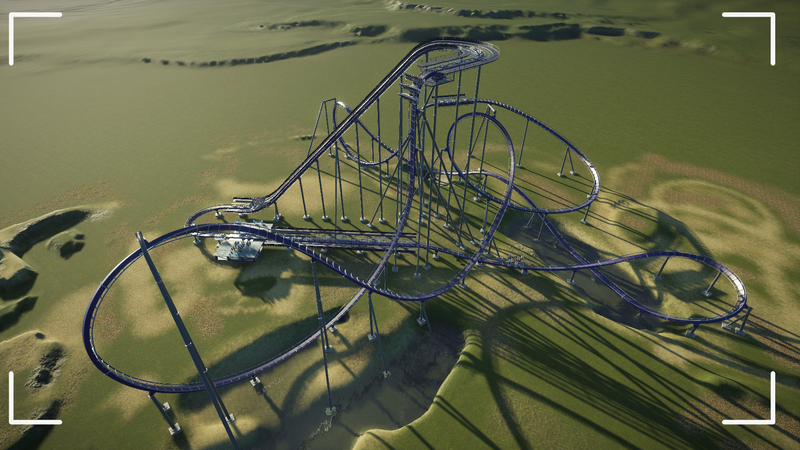 Everyone was attracted to Specter so this poor ride was neglected. Oh well, more for me! 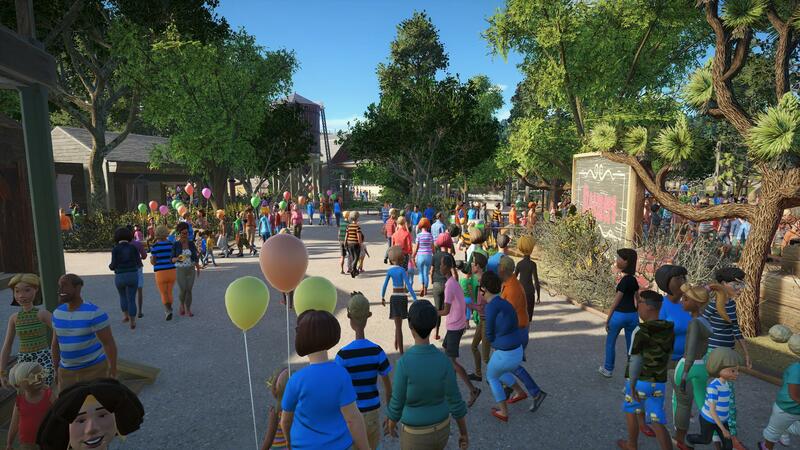 I think this the most realistically designed theme park I've seen with this game. A lot of that has to do with the scale at which you're building. 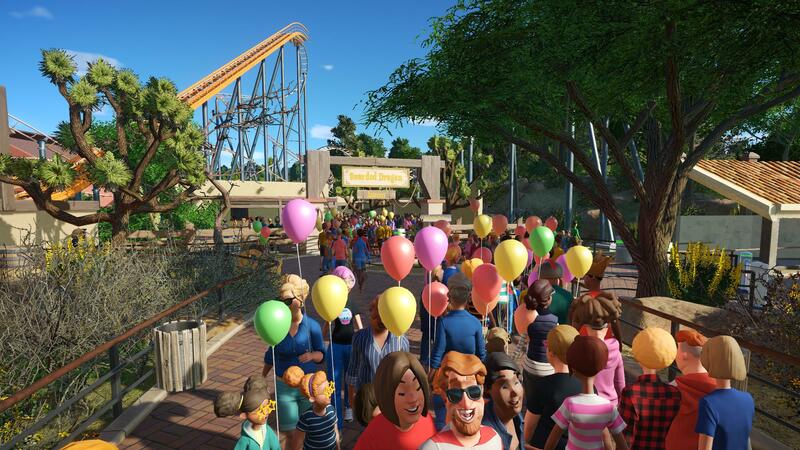 It fits the peeps well, but also fits the coasters and larger rides well. Really well done, the detail is incredible. 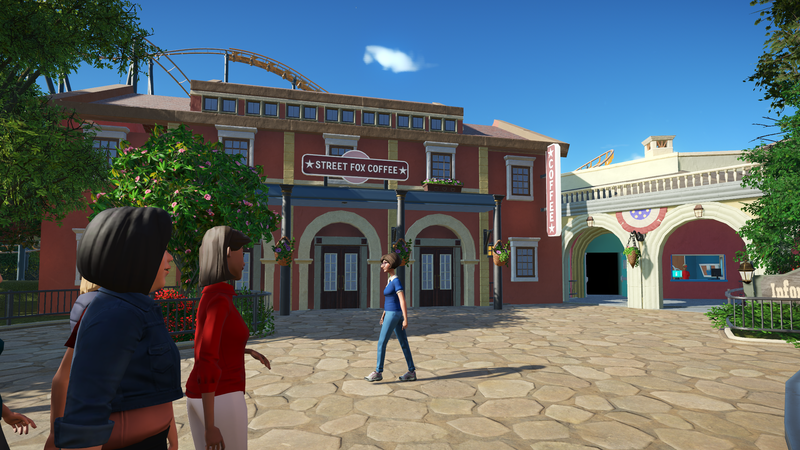 I love the way you present your park! It has a lot of charm just like the park itself. 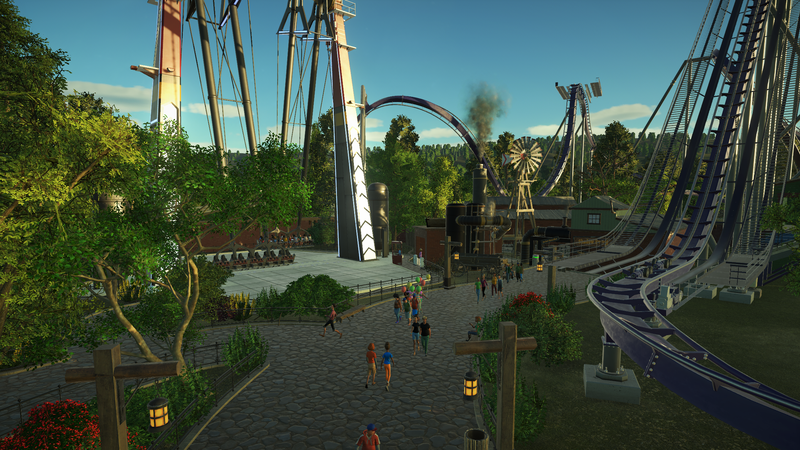 In almost every shot there's a nice coaster view in the background, very well done! 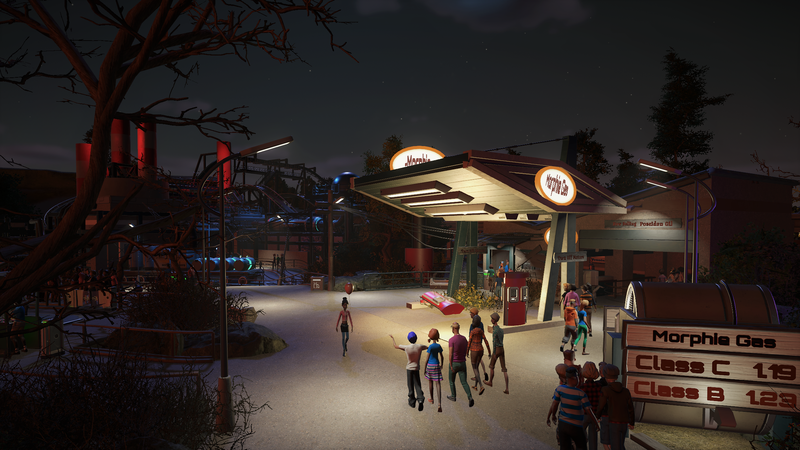 The gas station is an unique idea, well themed! 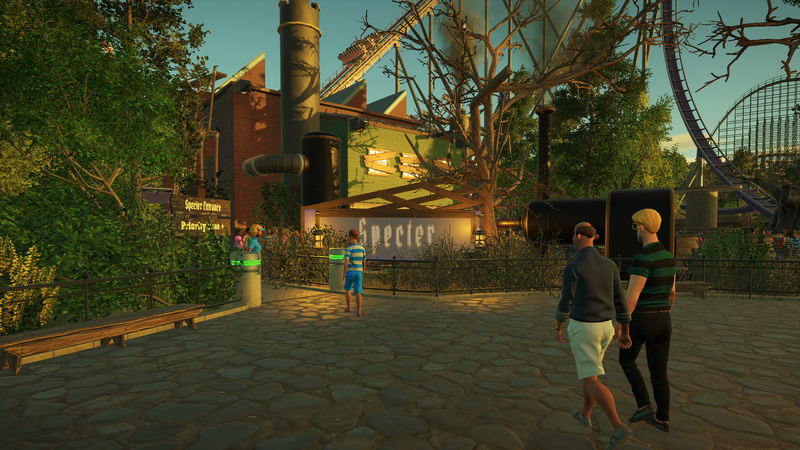 The rest of the park is not bad as well, I like your general style of building.